In November 2016, 27 states will hold elections for positions on their highest courts, including partisan and nonpartisan contested elections and up-or-down retention races. State supreme courts are the final word on issues of state law — from environmental regulation to criminal justice — and judicial races have become increasingly politicized and subject to special interest pressure. The Brennan Center is tracking TV advertisements in state supreme court elections across the country, including providing spending estimates and copies of ads and storyboards. Read our press releases for the latest analysis or see individual state ads on Buying Time. Interested in learning more? See how the Brennan Center is Rethinking Judicial Selection. Partisan rancor and an arms race of special interest spending in judicial elections reached new heights this cycle, as the record for TV spending by outside groups in state supreme court races was shattered. Click Here to see all Brennan Center press releases covering state supreme court races in 2016. The Brennan Center's interactive map illustrates state judicial selection trends across the country. 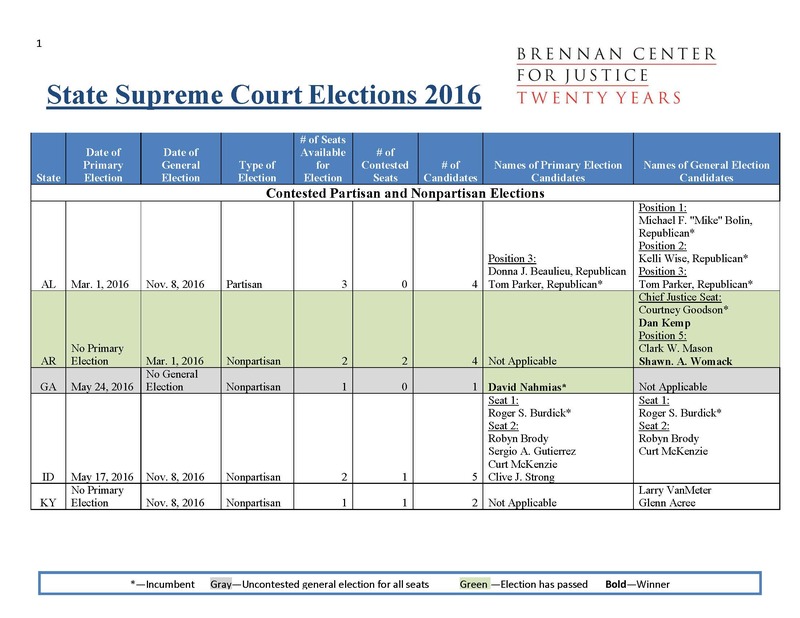 A complete chart of all state supreme court elections taking place in 2016, including the dates of the elections, types of elections, and candidate information. 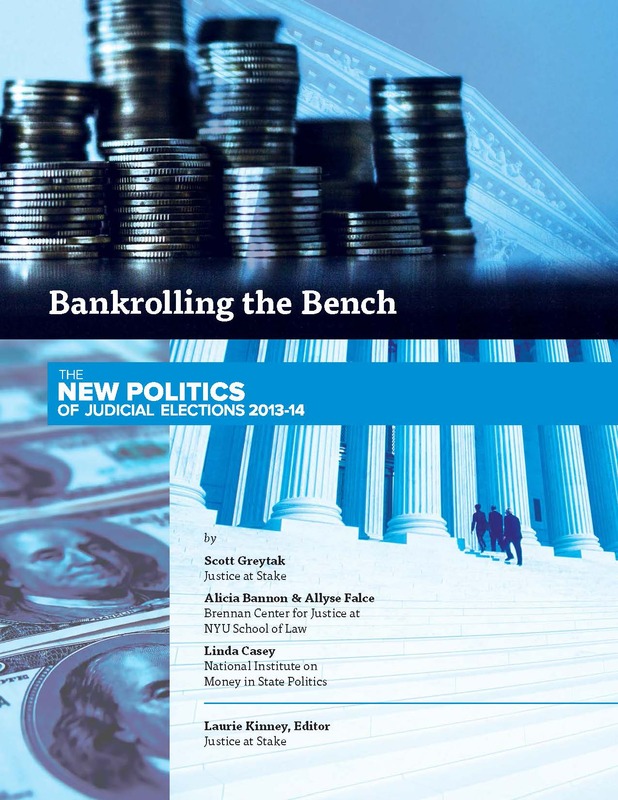 Since 2000, the Brennan Center's The New Politics of Judicial Elections series has documented the alarming rise of money in judicial elections, the dramatic upsurge in special interest group involvement, and the tendency of judicial campaigns to become "noisier, nastier and costlier." See reports from past election cycles here. See current and previous advertisements airing in state supreme court races along with spending and sponsor information. Want to know more? Click here for our full data sets used for the New Politics of Judicial Elections series. The rise of secret outside spending poses a major threat to the integrity of our justice system. Pressures of upcoming re-election campaigns make judges more punitive toward defendants in criminal cases, according to a growing body of empirical research. The latest episode of Last Week Tonight with John Oliver includes an appearance by Brennan's Alicia Bannon as they discuss the trouble with judicial elections.